At the XP Days on November 29. and 30. 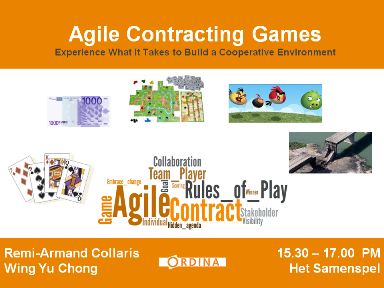 2012 in the netherlands and the Mini XP Day on April 26. in Belgium we present a workshop called "Agile Contracting Games - Experience What It Takes to Build a Cooperative Environment". In this workshop we play card games to investigate the topic of Agile contracting. Below you find the presentation and some related links.